It's way cooler now that I know it's aggressive. It must put those big mandibles to use. I love angry bugs. 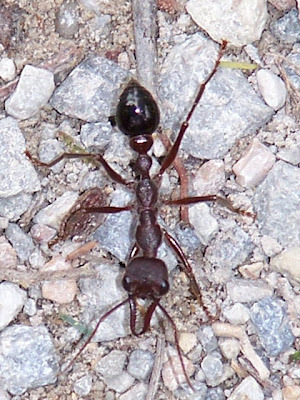 Looks like a bulldog ant. Aggro and they bite AND sting. And there I was, taking a picture of it... Then again, I also captured and released a Whitetail Spider before I knew what it was, too. And the other day I found some of what were apparently Redbacks in the compost bin.